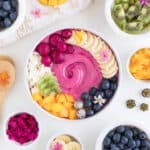 This tropical pitaya smoothie bowl is an easy and healthy breakfast. 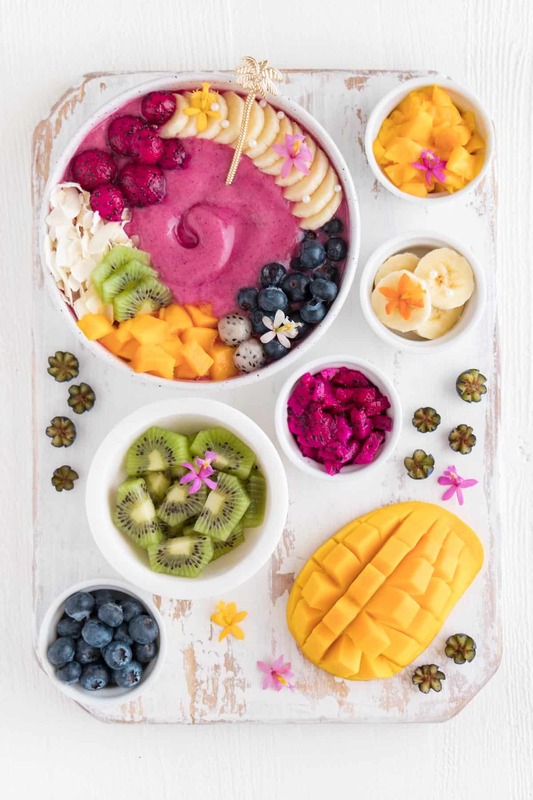 The delicious flavors of mango, lime, banana, and pitaya will have you craving this recipe daily! 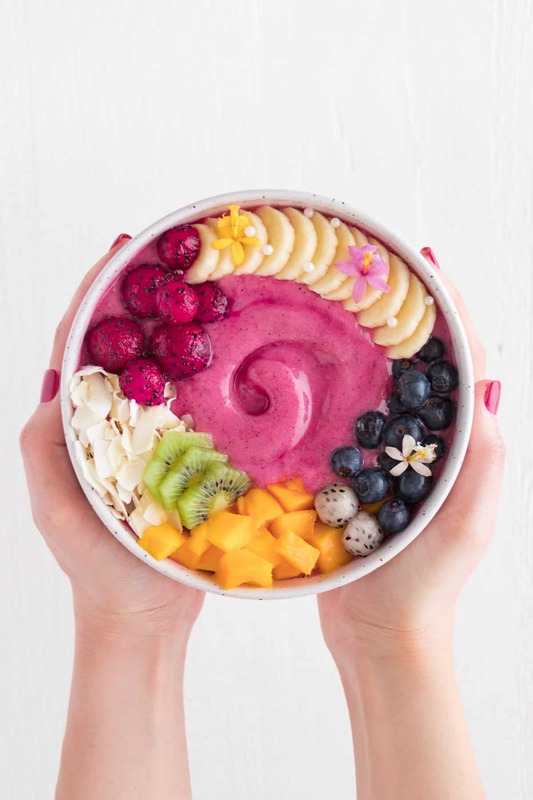 If you have never tried a tropical pitaya smoothie bowl before, you are probably wondering how to create this pretty pink bowl. What is pitaya? Pitaya, also known as dragon fruit, is a tropical fruit of the cactus species. It is indigenous to Central and South America. What does pitaya look like? Pitaya is commonly known for it’s exotic appearance. The outer peel is a deep fuchsia color with several green leaves stemming from it. The inside flesh comes in two different colors: white and red. As the name suggests, white pitaya contains white flesh. Red pitaya, on the other hand, displays a beautiful magenta flesh. What does pitaya taste like? Despite it’s bold appearance, the fruit tastes mildly sweet. The flavor is often compared to a pear while the texture is similar to a kiwi. Should I use red or white pitaya? 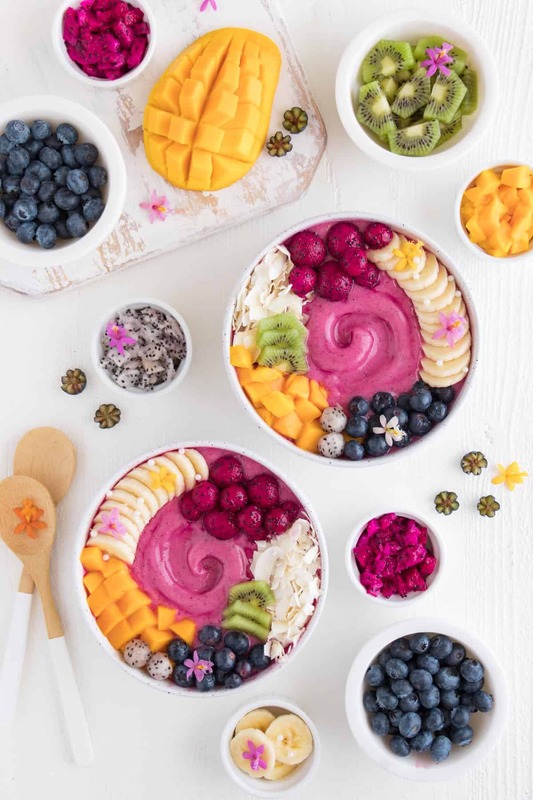 Always use the red variety for a pitaya smoothie bowl. This is where the magical pink appearance comes from! First, get your hands on some red pitaya. This exotic fruit is sold in three forms: fresh, frozen, and powdered. Personally, I prefer to use frozen pitaya packets because they taste best. Also, since the pitaya is frozen, your smoothie will have a thick and creamy consistency. So good! Second, gather your favorite fruits to pair with the pitaya. I love using frozen banana and mango, but you can choose any fruit you’d like. Again, make sure to use frozen fruit to achieve a lush smoothie texture. Third, add the pitaya + fruit of your choosing to a blender. Toss in a liquid (such as plant milk) and blend the ingredients until smooth. After, spoon the smoothie into a bowl and add your favorite toppings. As previously mentioned, I recommend using frozen pitaya instead of pitaya powder. You can buy fresh pitaya and freeze it yourself, or get some pre-frozen pitaya packets. 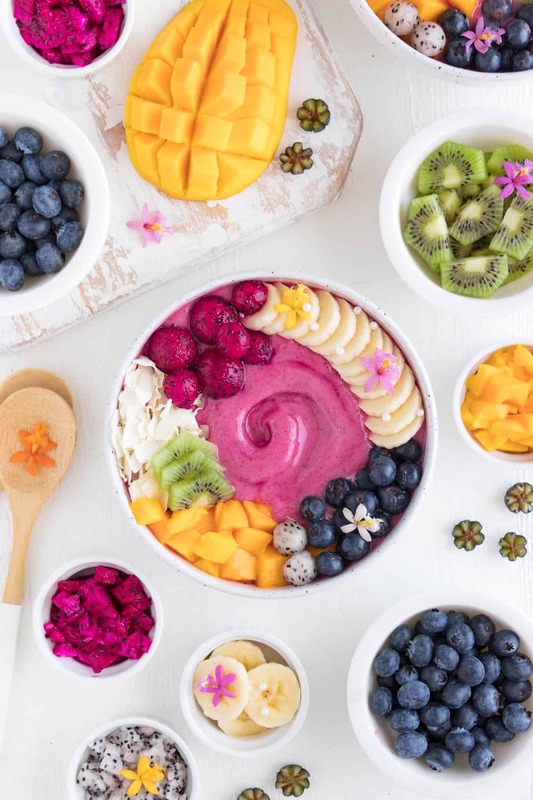 Whether you choose to use fresh, frozen, or powdered pitaya, always make sure the other fruit ingredients are frozen. Frozen fruit will create a thick and creamy consistency, like soft serve ice cream! For this particular recipe, I combined the frozen pitaya with banana, mango, lime juice, hemp seeds, and coconut milk. I love this combination because the sweet fruit pairs perfectly with the tart lime. Don’t have any lime juice in your pantry? No worries, use lemon juice instead. Get creative with the toppings! I added fresh fruit and coconut flakes on top of my bowl, but you can use anything you’d like. Granola, nut butter, chia seeds, hemp seeds, and goji berries are all delicious options. 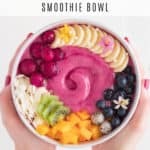 If you like this recipe, you may also enjoy my mango banana smoothie bowl and kiwi pear smoothie bowl!